Six Weeks to OMG is a trendy diet plan from British actor/ celebrity trainer Venice Fulton. Fulton claims to have a background in exercise physiology and nutrition as well as 10 years of experience helping celebrities get and stay fit. However, his credentials are hard to verify. In any event, Six Weeks to OMG claims that by using the book’s techniques, dieters can be skinnier than all their friends! The book also centers around Fulton’s “dieting rules” in which he believes are the key to being successful at weight loss. Six Weeks to OMG asserts that carbs are carbs and your body can’t tell the difference between chocolate cake and an apple. The author says that working your muscles to much can have negative results since muscle fibers tear during use. The OMG Diet stresses the calorie burning benefit of cold water since your body has to use energy to keep your core body temperature at 98.6° F.
Fulton says that breakfast should be skipped until after you can exercise. Exercising on an empty stomach causes the body to use its energy stores (fat). Six Weeks to OMG recommends black coffee because of its antioxidants, zero calories and metabolism stimulating properties. It also suppresses the appetite. Venice Fulton says to limit fruit because the body processes fructose (the main sugar in fruit) differently and this interferes with appetite hormones. Coffee, green leafy vegetables, limited fruit, chicken, protein powder, nuts, lean beef, fish, beans, lentils, brown rice, other fresh vegetables. Venice Fulton says that dieters should choose an exercise that activates the most muscles and do that exercise at least 30 minutes to an hour each day. But, stresses not to over do it as mentioned above. He believes that weight training/ muscle resistance exercises should be used to prevent the loss of muscle. 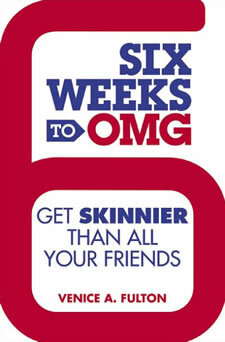 The book “Six Weeks to OMG – Get Skinnier Than All Your Friends retails for $24.99. Six Weeks to OMG appeals to young women and teens. Avoids refined sugar and processed food. People have had success with Venice Fulton’s plan. Some rules contradict what research has shown. Skipping meals can be dangerous for those with diabetes. Likely won’t appeal to some men. Could encourage an unhealthy need to be “skinnier than all your friends“. Black coffee won’t appeal to all dieters. Six Weeks to OMG is a diet plan that appeals to younger female dieters and addresses the cultural expectations placed on them in regards to appearance. Venice Fulton offers some good tips such as eliminating junk food and processed ingredients from the diet, but also supports some theories that wouldn’t be backed by what scientific research says about exercise and nutrition. Some girls may distort the message of the book as a competition to be the “skinniest girl”. This could be damaging emotionally and lead to eating disorders. The Six Weeks to OMG diet could be a good weight loss program as long as certain aspects of the plan are kept in perspective.